In the fall of 2013 I spent some time in Alberta and British Columbia, the two western most provinces in Canada. One of the places I visited was the town of Banff and spectacular Lake Louise. Banff National Park is a world renowned UNESCO World Heritage Site and Canada’s oldest National Park located in Alberta, Canada. Situated in the heart of the Rocky Mountains, it has some of the most breathtaking views Canada has to offer. The equally famous Lake Louise, located within Banff National Park, can be found about an hours drive west of Banff and is a must see for anyone visiting the area. While I’d been to Lake Louise before, it’d been quite a few years and I was looking forward to seeing this beautiful, azure and emerald colored lake again. I was visiting a friend for a few days and our plan was to do the hike from Lake Louise up to the Tea House on Lake Agnes, just one of many hikes available at Lake Louise and makes for an easy 1/2 day trek. Once at the tea house, we’d continue on hiking around the lake and up to a beautiful lookout atop a feature called the Bee Hive as an added bonus. This was the game plan but as all travelers know, things don’t always go according to plan. Our day started out admiring the beautiful Lake Louise on a clear and crisp, sunny, fall morning. The sun was just starting to crest over the mountains surrounding the lake, slowly revealing the beautiful colors of the water. 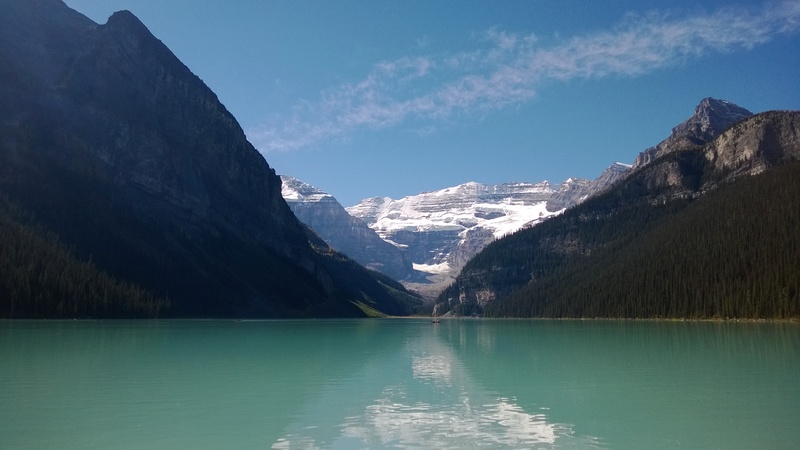 Lake Louise is fed by Victoria Glacier which can be seen towering over the far end of the lake, reinforcing the feelings that you are indeed in the heart of the Rocky Mountains. As we followed the easy path around the lake heading towards the trail head of the Tea House hike, we stopped numerous times, trying to take those postcard picture perfect shots. Its hard not to take too many photo’s, as with every step you feel that you found the perfect angle in which to capture the beauty of this majestic site. We continued along until we saw signs posted, directing us up, up and up a trail towards Lake Agnes and the Tea House. The hike started out in the forest, blocking any views of the lake but giving us some cool shade as we made the ascent. Soon enough we came to an opening along the trail that gave an incredible view of the Bow Valley and the mountains peaks that surround Lake Louise. In every direction we were awarded a new jaw dropping scene, with the valley in one direction, jagged mountain peaks in another and behind us the massive Bee Hive mountain (to which you can hike up to from Lake Agnes). Looking down the Bow Valley. Jagged mountain peaks surrounding Lake Louise. As we made the final effort up the last bit of trail we finally saw the Tea House and spectacular Lake Agnes, dominated by a high mountain wall wrapping around the far end of the lake, looking like an impenetrable fortress. After taking a break and admiring the views, we set out to hike around Lake Agnes and up to the top of the Bee Hive, which promised even more incredible views of the Rockies. And that’s when our plans changed… We had made it to the back side of Lake Agnes when my friend checked her pocket for the car keys as she was often doing during our hike. But this time she came up empty handed – no car keys! Trying not to panic we began searching the immediate area for the keys, knowing full well that they could be anywhere between us and the parking lot, a few kilometers behind us. Thankfully she remembered having the keys at the Tea House, just a short 500 m back. We had to abandon our aspirations for conquering the Bee Hive and focus on instead, securing our ride back home. I was certain that since the keys had been lost in such a small area, another hiker would have found them and turned them in at the Tea House. We kept our eyes pealed for keys as we walked the rocky path back to the Tea House and went inside to to ask the staff if anyone had turned in a set of keys. They said no (yikes!) but a couple who were enjoying a tea break at one of the tables, had mentioned to the staff that they had found a set of keys. With all our hopes resting on these strangers we asked if they had indeed found a set of lost car keys. Sure enough, they produced my friends keys, to which we profusely thanked for saving us from what would have been a very long trek back to my friends house just outside Calgary. At this point our schedule didn’t allow us to restart our trek up to the Bee Hive so we made our way back down the mountain in the splendid mid-day sun, promising to return one day to finish what we’d started. Even though we didn’t quite make it to our goal we’d had a wonderful fall day hiking in the beautiful Rocky Mountains, which was victory enough for me. Thanks! The Rockies are so beautiful, its hard not to take good photos!